In ‘Part 7 - Lindsay, the Internet, and Radicalization’, we will be joined by investigative journalist Mack Lamoureux (Vice) who will open our eyes to the troubling world of online radicalization in the context of Lindsay Souvannarath’s case. In life, Granger Taylor was known as something between an eccentric mechanic and a mad genius. At present day, he is known around the world as the man who left a note explaining he had gone on an interstellar voyage aboard a UFO and was never seen again. In this episode of Nighttime, We will be joined by investigative journalist Tyler Hooper who will share what he has learned about the life and cosmic end of Granger Taylor. At it's essence, this story is that of a rivalry between two competition psychics in Small town Ontario. Not unlike many business rivalries this too would quickly boil over and lead to a courtroom... the charges however were probably the last anyone would have expected. A little know, and long antiquated, law that criminalized the practice of witchcraft has sat awkwardly within the Canadian Criminal Code for several hundred years. Charges related to this law were incredible rare but as you will hear in this episode they weren’t impossible. Tonight, in this episode of Nighttime, We will be joined by Tiffany Butch, the subject of Canada's last witch Trial. The Story of Lindsay Souvannarath - 5 - Unloading James and Lindsay's "Arsenal"
In the forth and final part of this series we will again be joined by Lindsay Souvannarath. In ‘Life After Planning Death’ Nighttime will present portions of an extended discussion with Lindsay that cover Lindsay’s life from the point of her arrest until the present day. Throughout the conversation, Lindsay will discuss her legal battle, life in prison, her regrets, and much more. In part three of a series exploring the life and crime of the surviving would be shooter, the enigmatic Lindsay Souvannarath will rejoin Nighttime. In ‘Lindsay, James, and the Valentine’s Day Massacre’ Nighttime will present portions of an extended discussion with Lindsay that walk us through the birth, the planning, and the execution of the plot to kill as many people as possible in a shopping mall foodcourt. Throughout the conversation, Lindsay will provide background on many of the decisions made during the planning, the perilous journey to Halifax, and her arrest at the airport. It seems that nearly everyday we have a new example of someone, or someones, who's internal conflict culminates in a violent attack on members of the public. The fact that these events happen is terrifying, something that I’ve to dealt with using the same naive thought process that many affected by these tragedies can likely relate to. I've taken comfort in the ignorant believe that things like that wouldn't happen here, but regardless if you are referring to my here or yours, here is Exactly where these things happen. in 2015, on the eve of Valentine's day, the people of Halifax would learn they aren’t exempt from the type of nightmares that play out on American news stations. a local 19 year old James Gamble and his girlfriend, 23 year old American Lindsay Souvannarath, had taken the first steps in a plot to shoot and kill as many people as possible in the Halifax Shopping Centre food court before taking their own lives, just like the other murderous pair they idolized… the columbine shooters. In this introductory episode, the foundation will be laid for an ongoing series in which the surviving architect of the Valentine's day massacre, the enigmatic Lindsay Souvannarath, will break the silence she has maintained since boarding a plane to Nova Scotia with murderous intentions. Was it a Sasquatch in Pictou County, NS? In 2015, When I first launched Nighttime, One of the first requests I made to listeners was for story ideas that took place in, or in some way involved, the forest. The first response I received, lead me to this episodes story. Myles MacKenzie sent me an email sharing the story of an animal encounter he and some high school friends had in the woods of Pictou County Nova Scotia. Actually, "Animal Encounter" is a bit of and understatement. Don't roll your eyes before you hear the story but, Myles and his friends, they believe they encountered the legendary Bigfoot. It happened back in 2003, when Myles and a few members of his track team were running sprints in the dense woods of the Green hill provincial park. Whatever the group encountered, it wasn't like anything they nor their coach had experienced before or since. Nor was nothing they would ever forget. Tonight in this episode of Nighttime, we will be joined by both Myles MacKenzie as well as his high school track coach, his father Stephen MacKenzie. Our Topic, will be Pictou County's surprising history, with Bigfoot. When one hears a story like that of Taylor's murder it's hard to not digest the twists, turns, and surprise the way you would a work of fiction. In part one and two, Kayla and I made a point to discuss the character of Taylor Samson, and the role he played in the lives of many who stand heartbroken on the sidelines of this case. But, two people removed from the story can only take that so far. For part three, I wanted to place a cap stone on this series, something that brings the events surrounding Taylor's death into the right context... that being the senseless murder of a human being loved by many as a son, a friend, a student, an entrepreneur, and much more. Taylor's younger brother Connor Samson. Taylor Samson, a local university student, tells his girlfriend he has to run out for a moment and that he wouldn’t be long. When she see’s him exiting the apartment carrying a large duffel bag, she assumes it contains marijuana. When he fails to return home that night.. or ever again, she, and many others in Taylor’s life, begin to suspect he was the victim in a drug deal gone very wrong. What will start as a missing persons investigation will become one of Nova Scotia’s highest profile murder trials. One that sees two students of Halifax’s Dalhousie University at center stage. The Victim, Taylor Samson and the accused William Sandeson who at the time of Taylor’s murder was only days away from beginning classes at the prominent medical school. In this multi part series, I’ll be joined by Kayla Hounsell (author of First Degree: From Med-school to Murder). In this two part series, I’ll be joined by Kayla Hounsell (author of First Degree: From Med-school to Murder). When 20 year old Daniel Levesque moved from small town Revelstoke, BC to the comparatively big city of Victoria it was to pursue his dream of finding a career as a performing musician. Tragically, Daniel would only get a handful of weeks to make things happen as his time in Victoria, and the dreams that brought him there, would be snuffed out by the manager of the convenience store Daniel had taken a job at. That manager, Josh Bredo, befriended Daniel and weaved an intricate web of lies that played off Daniel's kindness, generosity, and his trusting nature. The lies would finally catch up to them both when Daniel showed up what he thought was Josh's condo, in what he expected to be an orientation for a new career as a legal secretary for Josh's mothers law firm. There was no orientation, no job... there wasn't even a law firm. There was just the manager of the 7/11 eleven, a man Daniel thought to be a friend... but he couldn't have been more wrong. In this two part series, Kristi Lee of Canadian True Crime and Jordan Bonaparte of Nighttime will collaborate on the telling of this story that should make anyone with a respect for justice scream. In part one, Kristi will provide a narrative account of the twists and turns in this heartbreaking story. In Part two, Jordan will take the lead on the story and feature an in depth discussion with Daniel's mom, the inspiring Stacey Thur. Did a Christmas Killer Stalk St. John's, Newfoundland? From 1978-1984, In the days surrounding the Christmas holidays, four women went missing from the downtown area of St. John's. One was found dead, three were never seen again, and all four were known to hitchhike. One that has the people of St. Johns asking who was taking a young women from the city each Christmas. On a past Nighttime episode ‘Tim Hortons, a Collection of Strange Events’, I shared several bizarre stories set in the popular coffee shop. In this update episode we will revisit the stranger than fiction story of Jesus Christ’s appearance on a Tim Hortons restaurant on Cape Breton Island. Our updates concern an alternative origin story of Jesus’ arrival to the building, as well as the future status of the holy site. The Mutual UFO Network (MUFON) is one of the world's oldest and largest civilian based UFO - investigative organizations. The stated mission of MUFON is the study of UFOs for the benefit of humanity through investigations, research, and education. 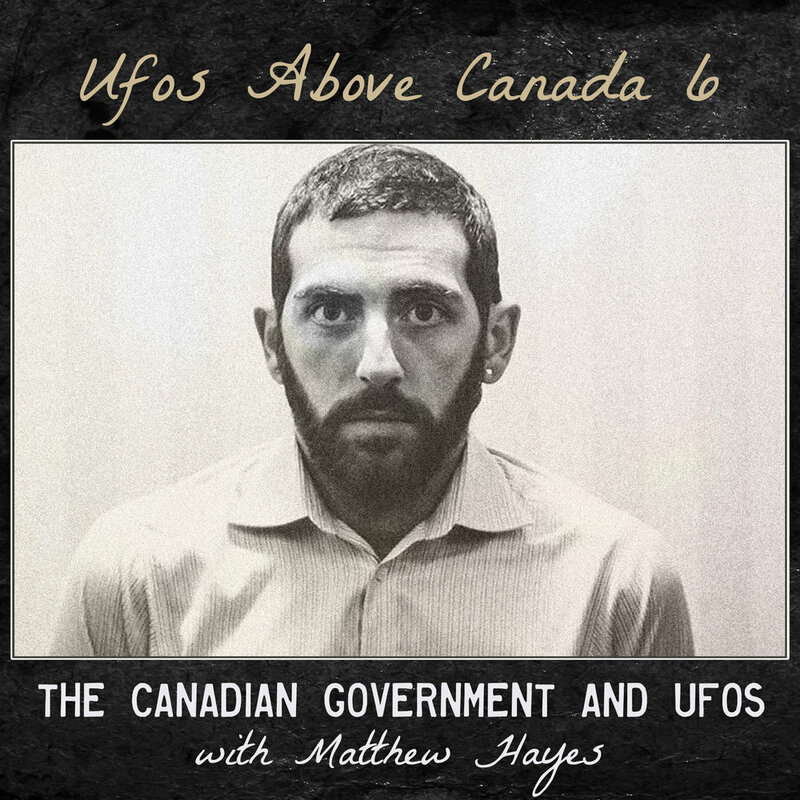 In this episode I will be joined by Stu Bundy, a member of MUFON's Internation Board of Directors and the Assistant National Director of Mufon Canada. During our conversation, Stu will remove the curtains that cover this sometimes shadowy, but fascinating organization. In the middle of the day and within the aisles of Shoppers Drug mart, an unprovoked stabbing leaves Rosemary Junor clinging to life. In the days after the attack, the city became captivated by the manhunt for the beautiful, well dressed women, security cameras captured placing a bloody kitchen knife on a makeup counter and calmly leaving the store. When the suspect is apprehended the story she tells involves mind control, nanotechnology, and a broad conspiracy. In this episode, we will pick up the story of Rohinie Bisesar from the point we left off in part one... Rohinie's twisted route through the Canadian legal system.